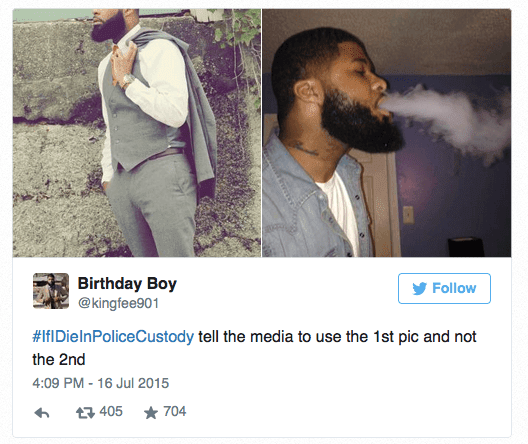 AverageBro: Of Profile Pics, Fearing Cops & Being Black In America. Of Profile Pics, Fearing Cops & Being Black In America. Earlier this week, after reading the disturbing story of a Tulsa, OK motorist shot by police, I had a sudden epiphany. I immediately changed my Facebook profile pic from a casual photo in shades and a basketball jersey to a serious pic of me, in a suit and tie professionally shot for the employee directory at my job. Why, might you ask? Well sure, because the professionally shot pic is nicer. But also because I know the power of narrative. Should something of this sort happen to me, the image that a majority of people would see whatever photo news agencies can locate first. Would I want that pic to show me as the playful husband of 15 years and father of three I am from 5-9, or the hardworking software engineer I am from 9-5? If this sounds like a bunch of pointless mental gymnastics to you, welcome to being black in America. Where you actually worry about your mortality on a daily basis and how others might form an opinion on how valuable (if at all) your life was based on a photo splashed across a news article. We see these photos when people like Philando Castille, Eric Garner, and yes, Terence Crutcher die. The photos are often informal, sometimes cropped to remove others, and more times that not fuel the narrative of what that person’s life meant. It’s why the families of the deceased often jump in to fill in some of the blanks about said person’s life. That the person in the grainy photo was a father, a husband, a son, a something of value that extends beyond whatever initial impression said photo formed. Because these people, however flawed, whatever their past might have included, mattered to someone. It’s why #IfIDieInPoliceCustody and other such hashtags trend from time to time. Because people want some control, no matter how fleeting, of how they’re perceived when they’re gone. Most of those people are black, hardworking, and have no criminal record to speak of. And that’s sad. Worrying about how the media might describe you after death, and how your kids/spouse would feel if that description is unfair is something I'm sure most of you've never even considered. Yet it's a thought that crosses my mind every time I see a police car. So yeah, suit & tie profile pic it is.